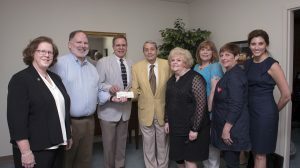 OXFORD, Miss – The Gertrude C. Ford Foundation completed its $20 million commitment to funding the world-class Gertrude C. Ford Center for the Performing Arts at the University of Mississippi with the presentation of a check for $1 million at a ceremony Tuesday in Jackson. The 88,000-square-foot Ford Center, which opened in 2002, has hosted graduations, plays, concerts and the 2008 presidential debate and many other important events. The center is paid for, thanks to the donation from the Ford Foundation, which has been a major contributor to several Ole Miss improvement projects and research efforts. Ford, wife the late of former U.S. Rep. Aaron Lane Ford, was raised in a family that greatly valued philanthropy down through its generations. Some 150 years ago, a $25 donation from her family helped the Andrew Female College Building Fund in Randolph County, Georgia. In 1991, she established the Gertrude C. Ford Foundation in Jackson. She died in 1996, but her legacy lives on through the foundation’s generous giving. Besides funding for the Ford Center, the foundation has given gifts to several other UM initiatives. It funded the Gertrude C. Ford Ballroom in The Inn at Ole Miss, the Daniel W. Jones, M.D. Chair For Faculty Support on the Oxford campus, the Suzan Thames Chair of Pediatrics at the UM Medical Center and land for Gertrude C. Ford Boulevard. In November 2016, the foundation announced a $10 million gift to the UM Medical Center to establish the Gertrude C. Ford MIND Research Center, which is dedicated to researching Alzheimer’s disease, the sixth-leading cause of death in the United States. More than 50,000 Mississippians suffer from Alzheimer’s or similar conditions. The Ford Foundation also announced in 2015 a $25 million commitment to the new Science, Technology, Engineering and Mathematics center, which is under construction on the Oxford campus. The donation is a testament to belief that the center will improve Mississippi through increasing general science literacy and through preparing a greater number of science, technology, engineering and mathematics graduates as well as K-12 teachers in those subjects. Cheryle Sims, who was a longtime friend and confidant of Mrs. Ford and serves on her foundation’s board, said the Ford Center for the Performing Arts and the foundation’s continuing partnership with the university is something her friend would be proud of. The foundation has helped realize the vision of both its namesake and the university – to build a performing arts center that is a gem of the region, said Julia Aubrey, Ford Center director. “This premier facility offers a beautiful atmosphere and technical support that enriches lives through the presentation of varied and diverse art forms,” Aubrey said. “The Ford Foundation has given us the opportunity to bring joy, reflection, connectivity, social relevance and entertainment to our audiences.